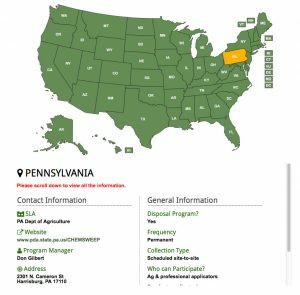 TPSA has compiled a US national database map of information supplied by State Pesticide Disposal offices. This interactive map provides data for the individual State office, website, Program manager, and contact information. In addition there is general information regarding Disposal Programs, Frequency, Collection Type and who can participate within the state. TPSA summarized the information provided by each State Pesticide Disposal Office. This page can be accessed under the Resources tab or please click here to view.